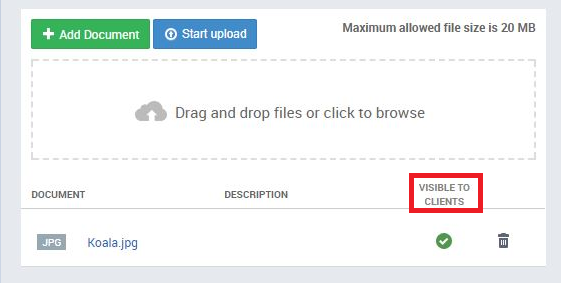 In the Client Documents section you can upload, view and edit any files connected to the Client. It can be found on the Client's profile under the Contact Persons section. 3. Choose whether the document will be visible to clients as well. If you tick it so it will be visible then the client will be able to view this document if they log into their client portal and go to their Documents section. To open the document, simply click on it's name and to delete it click on the little trashcan icon on the right hand side of it.